Mainers for Health Care rally outside the State House prior to Gov. Paul LePage's State of the State address, Tuesday, Feb. 13, 2018, in Augusta, Maine. 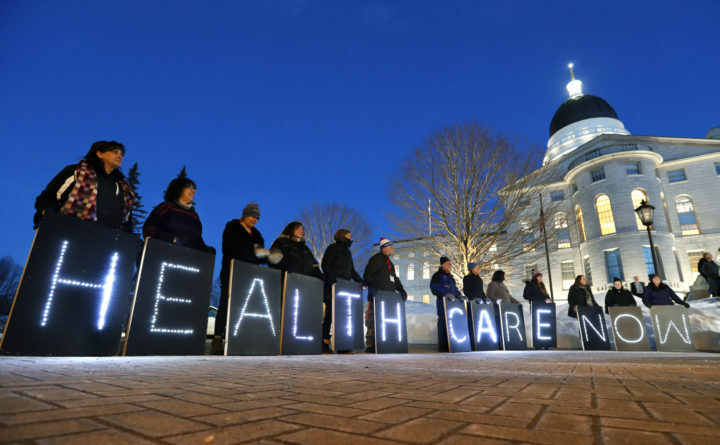 AUGUSTA, Maine — Some lawmakers said Monday that Maine’s Republican governor has been floating a new tax on hospitals to pay for voter-approved Medicaid expansion. Republican Senate President Mike Thibodeau said that Gov. Paul LePage’s administration has sent word the governor is considering the idea. LePage’s office didn’t respond to repeated requests for comment. Maine Hospital Association Vice President of Government Affairs and Communications Jeffrey Austin said the idea would be opposed by Maine hospitals that already pay $100 million in taxes each year. Mainers voted last fall to expand Medicaid to over 70,000 low-income adults by July 2. But Medicaid expansion is on hold as LePage’s administration fights a lawsuit by advocates calling on the governor to stop blocking expansion. LePage’s administration for months has argued lawmakers must first appropriate money for expansion — under his terms, which includes no tax increases.